Jordan is home to numerous places that can justifiably be called ‘enchanting’; walking through Petra by night or floating in the Dead Sea at sunset are some of the most magical experiences I’ve ever had. Another place that absolutely fits the bill is the Evason Ma’in Hot Springs. 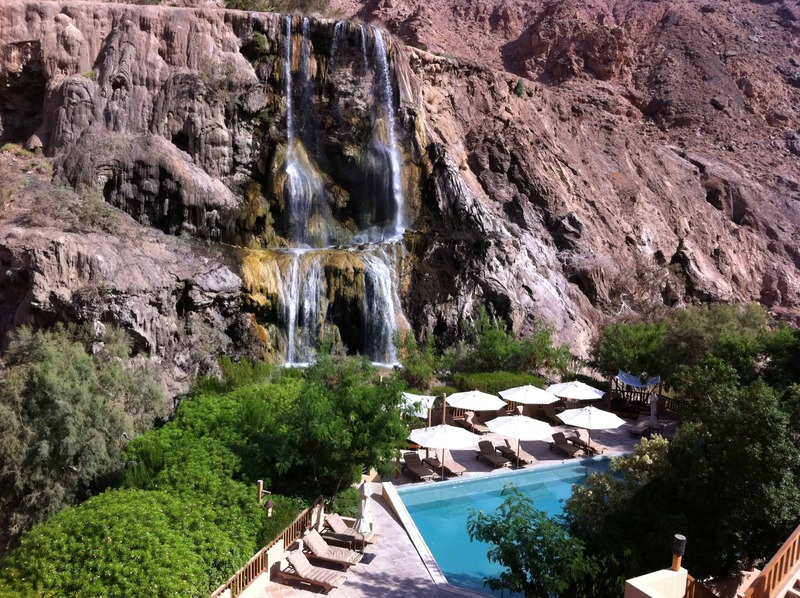 The Ma’in hot springs are located near the Dead Sea, about an hour’s drive southwest of Amman, in a spectacular canyon 264m below sea level. The last stretch of the drive from Amman, through mountains and down into the canyon is especially stunning. As the road winds its way down to the canyon floor, you’ll be treated to amazing panoramic views of the orangy-ochre coloured mountains, the canyon and the gorgeous palm-fringed oasis cosily nestled in the valley. The first glimpses of the Evason Ma’in hot springs are simply unforgettable. Towering mountains on both sides provide a stunning frame for a lush, green oasis, with waterfalls gracefully tumbling down slopes which resemble melted chocolate; it’s a sight that I found remarkably soothing. That feeling continued when I entered the resort where I was greeted by a very pleasant lobby with plush wooden furnishing, large cushions and gorgeous lamps. The interior of the resort, clearly Arabian with Asian influences, coalesce effortlessly with the natural surroundings to create a relaxing, earthy atmosphere. The first thing I did before checking into my room was to find the closest terrace and take in the view. I plonked myself into a comfortable chair, ordered a glass of delicious Machareus Chardonnay-Sauvignon Blanc from the local Zumot estate and simply gasped at the incredible view: a true Velvet Moment there! I grabbed every opportunity I had during my stay to sit and enjoy this enchanting view, both day and night, for a drink or a meal. My next stop was my room and it was just as inviting as the rest of the resort, with cosy, wooden furniture, a large bed and a delightfully spacious bathroom. The Evason Ma’in is renowned for the curative properties of the hot springs which flow from a volcanic source deep in the mountains. The stream runs along the edges of the canyon before tumbling down to the valley at various points, forming several waterfalls. The temperature of the mineral-rich water averages around 40 degrees Celcius. There is a public pool at one of the falls, another pool at the Evason resort (for guests) and a third pool at the wonderfully secluded Six Senses Spa. The Spa is located a short walk or drive away from the resort. The only way I can describe the place is to call it an oasis of relaxation and indulgence. The pool area, with the waterfall elegantly cascading into the pool, is simply gorgeous. 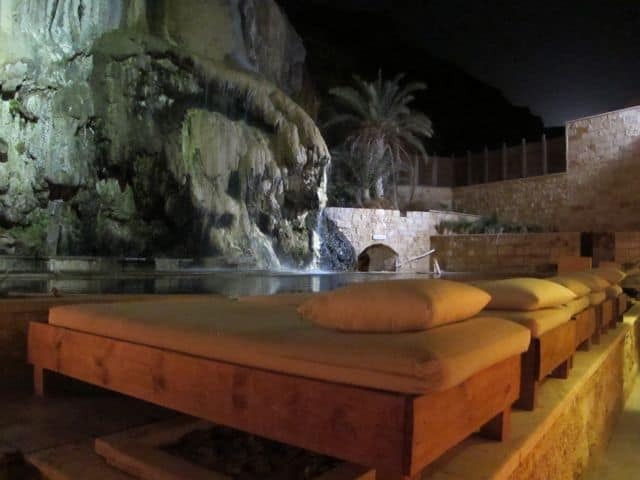 Another unique feature of the pool area is the natural sauna – in a cave next to the pool. It’s a small cave with a stream running through it, and you have to bend low to get in but the heat will soon get you sweating! After a quick swim in the warm water and a few minutes of sitting under the waterfall, it was time for my massage. I chose the Swedish deep tissue massage and it was seriously one of the best massages I’ve ever had. The therapist did a brilliant job in kneading away the knots in my shoulders – she could tell I spend a lot of time online! I returned to the pool after my massage. By this time, it was dark and there was no one around – I felt absolutely regal in my solitude under the starry sky. There’s more at the resort to keep you occupied aside from the hot springs and the Spa. In the mornings, guests can go for a stroll along the canyon and end just in time for a unique breakfast on a promontory – breakfast is reeled in on a rope across the canyon from the resort! Another unique activity is the open-air cinema where guests can watch movies, with the walls of the canyon as a spectacular backdrop and nothing but the star-studded sky above. 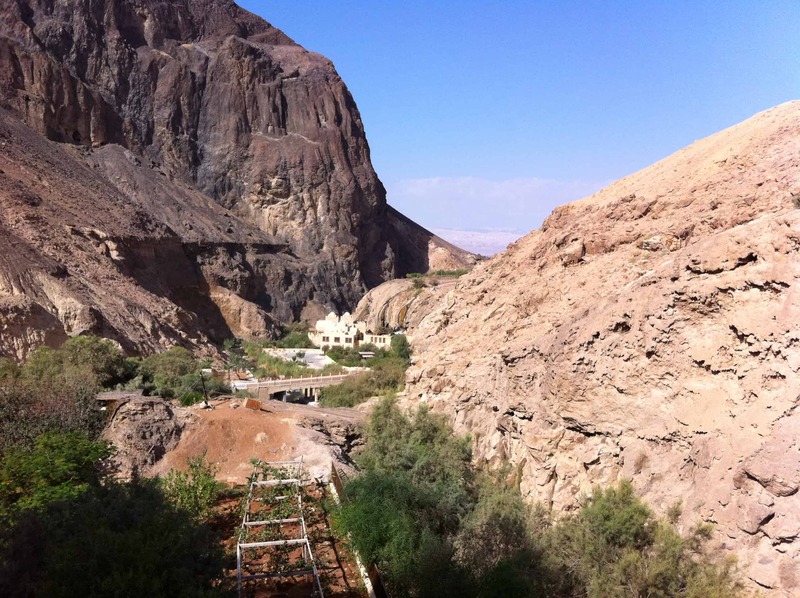 The resort also organises guided walks through the canyon – it’s possible to hike through the canyon to the Dead Sea. The Evason Ma’in Hot Springs is a truly enchanting place. The stunning natural surroundings and the blissful seclusion combined with great service in an environmentally-friendly resort make it the perfect retreat for those seeking relaxation and a dose of indulgence. Note: A big thank you goes to Visit Jordan and Evason Ma’in for your gracious hospitality. As always, views expressed in this post are mine. Thanks for sharing your experience. It really is a beautiful and amazing place. It truly is an oasis. Too bad access to the Spa (third pool) and facilities are an additional $53 extra per person, even for paid overnight hotel guests. Really kind of takes away a bit of the magic in my opinion. But the breakfast is one of the best I’ve had at a Jordan hotel or resort! Glad you had such a great trip. That sounds wonderful, like heaven. Thanks for sharing… we wanted to be right there with you chatting having a glass of wine. We stayed there in August. Its absolutely fantastic and I’ll definitely go back some day.